SURFERS PARADISE/QLD (Tuesday, 6th March/2018): The Australian surfing community gathered on the Gold Coast tonight to honour 1993 Women’s World Champion Pauline Menczer who was inducted into the Australian Surfing Hall of Fame. Menczer became the 40th inductee into the Hall of Fame, cementing herself as one of surfing’s great individuals. She overcame enormous odds, including lack of sponsorship and crippling rheumatoid arthritis, to build a superb pro surfing career, including an epic world title win. She defied every possible female stereotype in the process, sustained by her ingrained surfing talent, courage, and a lethal sense of humour. In the process, she also earned the complete respect of every other surfer on tour. Menczer’s induction was one of a number of presentations as part of the 2018 Australian Surfing Awards. It was a family affair for top individual honours with 2017 WSL Women’s World Champion Tyler Wright and brother Owen winning the Female and Male Surfer of the Year awards, while young Queenslander Reef Heazlewood and North Shelly’s World Junior Champion Macy Callaghan won the Male and Female Rising Star Awards. Local lad Ryan Hipwood was awarded the Milwaukee Heavy Water Award. Hipwood received $2,000 and a Milwaukee tool pack valued at $1,849 for his impressive year that included a stand out performance at the season-ending Pea’ahi Challenge at Jaws in Hawaii. The Peter Troy Lifestyle Award which is presented to the person who has given his or her life over to surfing, and in doing so has enriched the lives of other Australian surfers over time was awarded to David ‘Rasta’ Rastovich who took a different line through a surfing life, devoting himself to a better understanding of the natural world and of human relationships within the sport. He has pioneered and assisted with numerous charitable and beneficial ocean and surf related causes, frequently putting his mind and body on the line in the process. The ASB Greater Good Award was taken out by famous surfboard shaper Nev Hyman’s ‘Nevhouse’ - a cheap and effective method of small-house construction which can be used in the aftermath of traumatic natural disasters in Third World countries. The Surf Culture Award for a project that captures and explores a quintessential element of Australian surfing culture was won by "The Life of Brine" by Phil Jarratt whilst the Simon Anderson Club Award was taken out by Coffs Harbour Boardriders Club. Trent Mitchell’s amazing convergence of four waves was named the Nikon Surf Photo of the Year and ‘The Big Wave Project’ by Tim Bonython the Nikon Surf Video of the Year. The winners of the Nikon Surf Photo of the Year and Nikon Surf Video of the Year received a brand-new, top-of-the-line Nikon D850 and NIKKOR AF-S 24-120mm f/4G ED VR lens – valued at $6,800. Don O'Rorke was awarded Surfing Australia Life Membership tonight, having retired from the board of Surfing Australia in November 2017, after 12 years service. 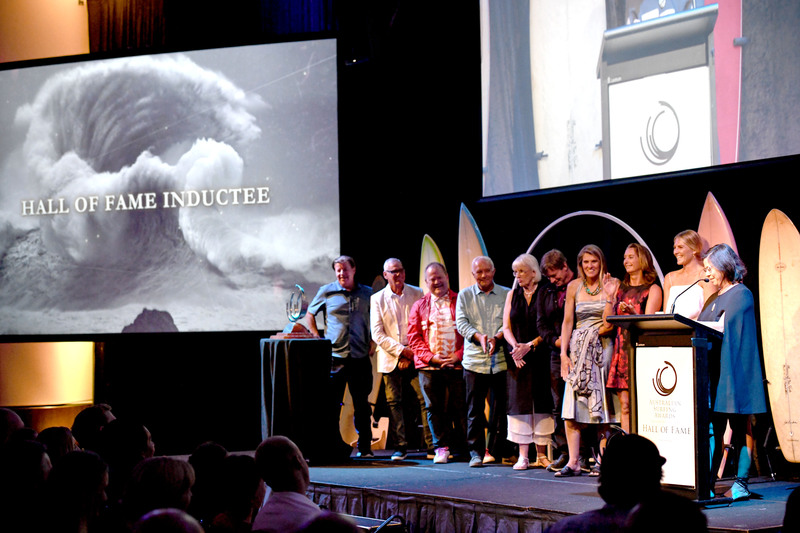 The Australian Surfing Awards honours and celebrates our sport’s great achievers and those who have made a significant contribution to the development of surfing in Australia. The Australian Surfing Awards incorporating the Hall of Fame is proudly supported by Tourism and Events Queensland, QT Gold Coast, the Australian Sports Commission, Nikon, Milwaukee, nudie, Australasian Surf Business Magazine, XXXX Summer Bright Lager, Drinkwise, OnStone and Andrew Peace.